Check out the camps we are offering in Summer 2019 and click on the links to find out more and to register! Summer Camp registration opens online Feb 6 at 6pm for Howard County residents and online Feb 13 at 6pm for the general public! Medication Authorization Form - required if bringing epi-pens, inhalers or other medication to camp. Please note that a Physician's signature is required on the medication form. We cannot accept any medications without this signature. School medication forms are not accepted. In order to ensure the safety of children enrolled in camps, any adult picking up a child from camp must be listed on the camper's Participant Information Form as authorized to pick up the participant. This year, all camp staff are required to have you show a government issued photo ID (driver's license, passport, U.S. military ID, or permanent resident card) at pick up before they release campers to you. When packing your child's lunch or snack for camp, please note that all camps are nut-free. Do not pack your child items with peanut butter or other nut-butters, or with nuts listed in the ingredients. Click on the photo below to view pictures from last year's camps! 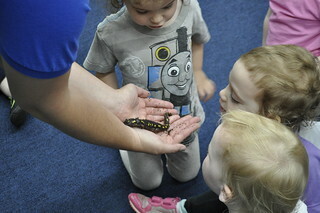 Enjoy wildlife and water wonders while doing hands-on science and nature activities. Create rainbows and gigantic bubbles. Learn about park wildlife and caring for the park. Fee includes special take-home surprise on Friday. Bring a snack and beverage (no nut products). Detailed info and camp participant forms are mailed to registrants approximately two weeks prior the start of each camp session. Information: Dawn Thomas 410-313-1754, or dthomas@howardcountymd.gov. Click the RP numbers above to sign up online! The camp will run 9:15am until 12:15pm each day. Registration verification and camper check-in will take place on Monday morning as campers arrive. Each day a parent must sign in their child in the morning and sign them out at the end of the camp day. On the first day of camp, please bring a light colored t-shirt for your child to paint. Also send a nature picture (animal, flower, tree, etc.). The campers will talk about their pictures during circle time. The recommended attire for camp is a t-shirt, shorts, LONG white socks and old sturdy sneakers. These clothes will sometimes become muddied and wet during the activities. Billed caps and sunscreen are advised (Please apply sunscreen and/or bug spray prior to camp). We will go out on a hike each day, rain or shine. Shoes should be securely closed (laced or Velcro) and must be worn at all times during the camp program. NO SANDALS PLEASE! On creek day, Thursday (rain date Friday), you may pack old shoes or boots for your child to wear. Send a water bottle and a snack for your child each day. Please do not bring any snacks that contain peanut or nut products (other children may be allergic). Avoid apple juice and apples as they attract BEES! Take Route 29 to Route 108 West. Follow Route 108 for about 3 miles. You will go past Centennial Park (on your right), past Centennial Lane, past the entrance to Cedar Lane Park East (on your left), to Cedar Lane. Turn left on Cedar Lane and follow to the park entrance on the left. The camp will meet around the right side of the building near the playground. Can't find what you're looking for? Call Robinson at 410-313-0400 during business hours (Weds-Sat from 9AM-5PM and Sun from Noon-5PM) or the Adventure & Outdoor unit at 410-313-1754 (for Kinder Tykes Camp and more Adventure Camps!). For a complete list of Howard County Recreation & Parks camps, click here.